CN Design Blog: Glass, Glass and More Glass! From beautiful public displays to tile backsplashes, I can't get enough of glass! 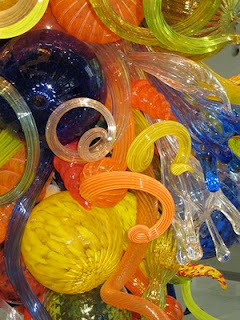 Of course, when I think of beautiful and colorful glass art, world-premiere glass artist Dale Chihuly immediately comes to mind. Chihuly has truly revolutionized the art of blown glass. The scope of his work is breathtaking and his use of vibrant colors is stunning! 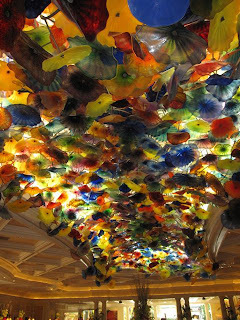 No visit to Las Vegas is complete without a walk through the lobby of the Bellagio Hotel, where the ceiling is adorned with an awe-inspiring display of 2,000 hand-blown glass flowers called Fiori di Como. 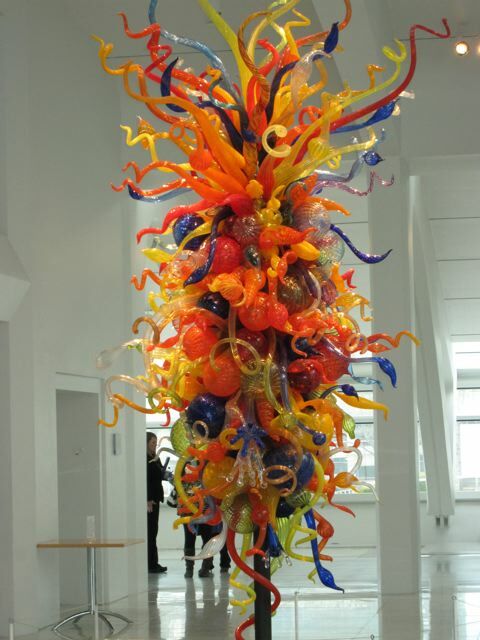 The Milwaukee Art Museum, a beautiful museum located on Lake Michigan, showcases a stunning Chihuly piece in its lobby. Again, the shapes and colors in his work are magnificient! Earlier this month I participated in the Minnesota Tile Festival, sponsored by the Handmade Tile Association and held at the Midtown Global Market. 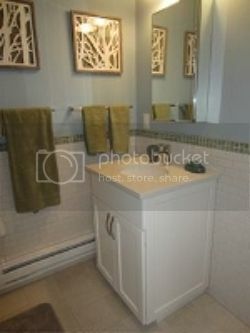 Since I love using handmade tile in my kitchen and bath projects, it was a thrill to participate! It was a wonderful event and the participating tile artists were incredibly talented. 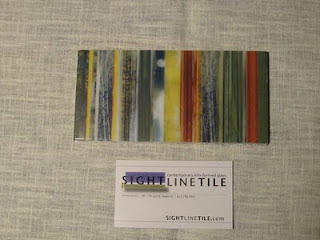 One of my favorite was SIGHTline Tile. Artists Amy Bauer and Brian Bolden introduced me to their new line of web printed glass tile for residential use. I can't wait to use them with a new client! 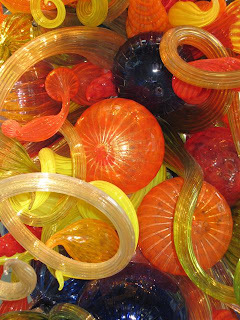 Tile isn't the only way you can incorporate beautiful and unique glass in your kitchen or bathroom. 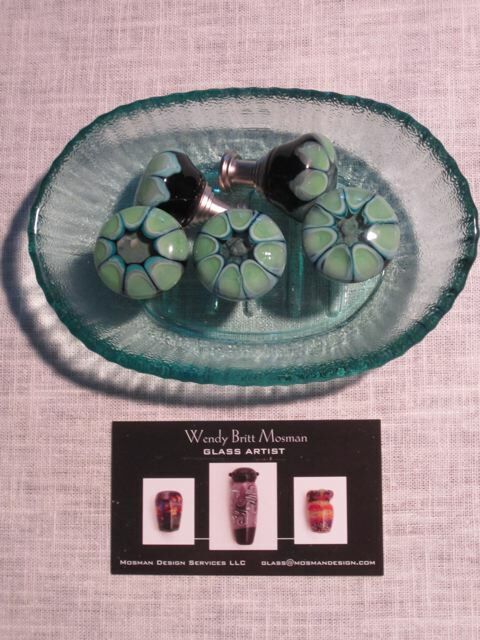 I love local artist Wendy Mosman's gorgeous lampwork cabinet hardware. Christine Nelson Design in Spaces Magazine! The October issue of Spaces Magazine features a bathroom remodel that I did with the Anderson family in south Minneapolis. Like many homes in South Minneapolis, the Andersons' one small bath had many challenges that went beyond just its size. 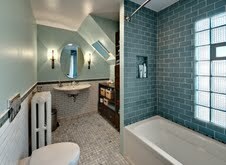 The door opened into the bath and there was a sloped ceiling. We discovered some space behind the tall linen closet in the adjoining bedroom, as well as some space behind the slopped roof line, which gave us three extra feet and allowed up to move the sink. 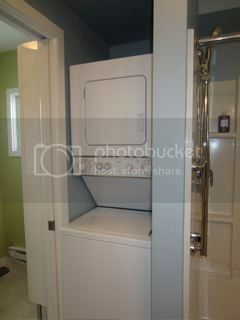 I love the tankless toilet! In a small bathroom like this one, not only does it save valuable space between the toliet and tub, but it also has cool, contemporary lines. You can pick up complimentary copies of Spaces Magazine at Twin Cities' Kowalski's Markets; Bachmans; All, Inc.; Ferguson's Golden Valley showroom; Hoigaards; and Euro Nest.